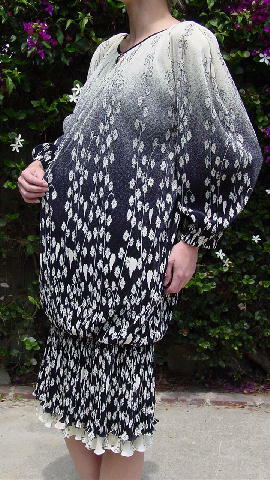 This vintage Virginie dress is 100% (polyamide) nylon and was made in France. There are peasant sleeves with a wide elastic band at the ends, fabric matching shoulder pads, and a very wide scoop neckline. There are horizontal micromini pleats covering the entire dress. It has that 1950s styling of a sack dress mixed with a lower two tier full bottom skirt that ends in a ruffled hemline. 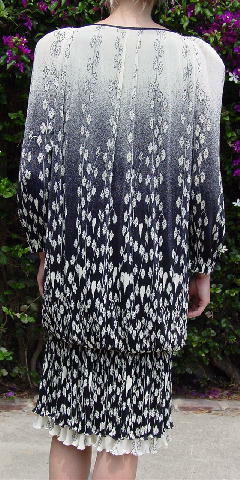 It's in an antique white and light (going to dark) black with a floral pattern. 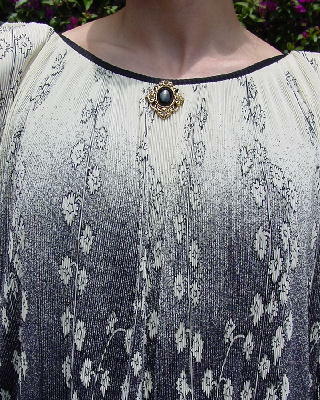 It has a brooch-like ornament sewn below the neckline.